Besides from its busy streets and capital city title, Madrid has a great scene for local markets too! The best way to experience a new city is to live it through its markets. You can see locals are shopping, sellers are trying to negotiate, colorful displays on the stalls and the “behind the scenes” of the real city. Here is our guide to local shopping in Madrid to help you so can also feel like a local there! The food markets are a lot in the city, so it is for sure that there is no shortage. Eat well, find good treasures and shop like a local while you are there! Here are the 9 best markets in Madrid! You want to eat good tapas and drinks? To San Miguel. Do you want to experience an upscale food market experience? Go to Platea. Local fresh produce market? Maravillas. Second-hand shopping? El Rastro. There is a kind of market for each kind of occasion in Madrid so don’t worry. Whatever you are looking for is somewhere out there! Go out, walk around and have a break after you do some sightseeing – will worth every minute. Bon shopping! Who doesn’t like a good place to see every kind of food, nice smells, and busy food stalls? San Miguel is a perfect place if you are foodie looking forward to trying many specialties at the same time. San Miguel Market does not only offers Spanish food but also has stalls selling international food There is always a sampling going on, so you can just try the food and decide where to eat a bigger portion too. It is not only a feast for your belly but also for the eye! Everything looks amazing, smells wonderful and it is pretty hard to stop yourself from tasting everything you see! Grab some tapas – the price range is pretty large from 1€ to 16€, and order a vermouth or wine and relax! 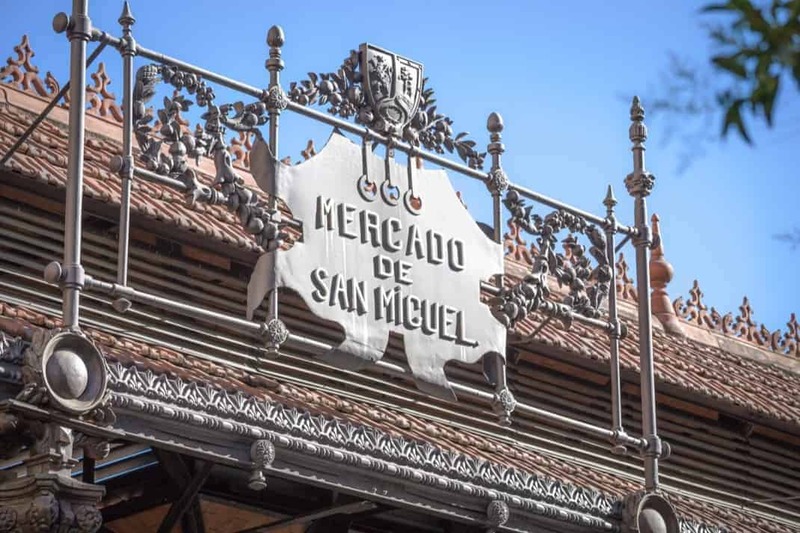 San Miguel Market, Madrid #mercadodesanmiguel #sanmiguelmarket #madrid #españa #spain #foodmarket #lovethevibes #architecture #beautiful #yummy #delicious #? El Huerto de Lucas is a modern complex that aims to offer eco-friendly, organic and sustainable options for the people. The whole complex comprises of a big venue, an organic coffee house, an eco-bistro and area for the organic food market. There is every kind of items including makeup, cleaning products, dry goods, textile, food containers and many more. The market was founded to promote and develop good health. Simply by eliminating toxins, additives, chemicals from our daily life and promoting toxin-free and organic production. This market is the best for the eco-friendly travelers, there are also food options available for many diet types including lactose-free, gluten-free, and vegetarian and vegan! If you want to see a real local market where real residents of Madrid are shopping, Mercado de Maravillas is the market to visit. There is a section for every kind of food here; vegetables, fruit, cheese, salami, seafood, condiments and dry goods like spices. The stalls are usually owned by families. It is not located in a touristic area so unlike other markets, you may have a hard time with the language as most of them speak only Spanish! Especially if you like cooking, this is where you can get sublime ingredients for seasonal, fresh and high-quality food. Visit stalls to see how they prepare the cuts of Iberico ham, delicious sandwiches, meat cuts or simply to see the daily life of Madrid people. It will be a great experience in every way. If you feel like giving a break, there are two bars in the market, where you can eat some local food, good tapas and watch the stalls too! Platea is a magical place to experience a fine-eating version market in Madrid. The interior looks like an opera house which is not surprising because if you are lucky you might even catch a show here while tasting different foods. There are different spaces in the building. El Foson which serves international food including Peruvian and Asian dishes, El Patio – tapas and bar area. Also there are Canalla Bistro – a restaurant operated by Michelin star chef Ricard Camarena, El Palco – cocktail bar and El Club – obviously the club. The options are endless here, however, it is more costly than other markets in the town as it targets a fine-eating focused crowd. Nonetheless, it worths to see even the atmosphere here, it is fantastic and you will feel like you are invited to a meal at the Great Gatsby! El Rastro is the most popular flea and second-hand market not only in Madrid but also in Spain – it is the oldest street market. The stalls are scattered around a very large area that in every street you can find something else. In the old times, it was mostly a marker where antique objects are sold. However, now the market got pretty big and you can find brand-new items too including jewelry, clothes, shoes or hand-made objects as well. Especially if you go further from the main road for the market, the prices get cheaper and around the closing time, you might something half the price – such a deal! The area gets pretty crowded consider the fact that it is only on Sundays, take good care of your belongings. If you feel like it, there are food stalls as well, to make sure you are well-wed during shopping. San Anton Market is located in the lively neighborhood of Chueca in Madrid. There are three levels here offering different experiences. The first floor is designed as a traditional market where you can find fresh ingredients, salumi and cheese stalls and tends to close earlier than other floors. The second floor is a place where you can taste food made with the ingredients obtained from downstairs, a very casual and vibrant eating place and also there is a modern art gallery. The third floor has a more upscale restaurant and has a very nice view with a terrace. It is smaller than San Miguel Market and less busy – so if you are looking for a calmer ambiance, you should visit San Anton. Open: Varies for each floor, 2nd floor is open every day. Nomada is a very exciting fair, held four times a year in the same location. The market aims to be a place to support young designers and start-up companies for promising artists. The place gets pretty crowded and applications are held seasonally – which means you can also apply with your own portfolio and products too. The beauty of the market is you can shop the most unique pieces from young artists like bags, shoes, and hand-made objects, jewelry – imagine everything about arts and crafts. So if you are around town in Nomada Market days, it is a must-visit for a design and art lovers. Almost everything is eye-catching and inspiring here, it is hard to choose what to buy! Open: Four times a year, check their schedule for specific dates. Enjoying a rainy Saturday in Madrid with art&music! Aproveitando um sábado chuvoso em Madri com arte&música! Mercado de Motores is a flea market opened between the old carriages from trains which were formerly used as a train stop, not surprisingly near Delicias train station. The flea market has every kind of item available for you to shop. There are also street food style stalls are available and the environment is very family-friendly especially if you have a train loving kids. The stalls and the setting are pretty eclectic as it is possible to buy many things from artisanal olive soaps to old vinyl collections. You will see that the market is mostly filled with locals rather than travelers. If you are lucky, you can also listen to some live music while having a bite at the food and drink stalls. Open: Only on the second weekend of each month. Adelita Market is the ultimate place especially if you are looking for a second-hand market in Madrid. The whole idea behind Adelita is to put every item used back into the consumption cycle again to reuse and give a new life. It is a market for people who want to continue and facilitate the buy and sell cycle and make this possible for non-sectoral buyers and sellers. That means the stalls are occupied by volunteers. You can sell every kind of item you can ever imagine starting from electronics to sunglasses, books to curtains. Especially for second-hand clothes, Adelita is the best place to visit in Madrid. Open: Only on the third weekend of each month.